Our products come from our land and are the result of the passion to make our visitors taste the best Uco Valley aromas and flavors. NUNCA JAMAS speaks of a hidden land in the Uco Valley, where time stops and attunes to the rhythm of nature; where we learn to observe and care for each vine, to respect the life of the soil, to work nonstop and be able to wait, to prepare ourselves to receive the grapes in the winery, accompany them, guide them and sublimate them. Hand harvesting in 12 kg boxes. Double selection of bunches and grapes. Malolactic fermentation and aging during 14 months in French Oak barrels. 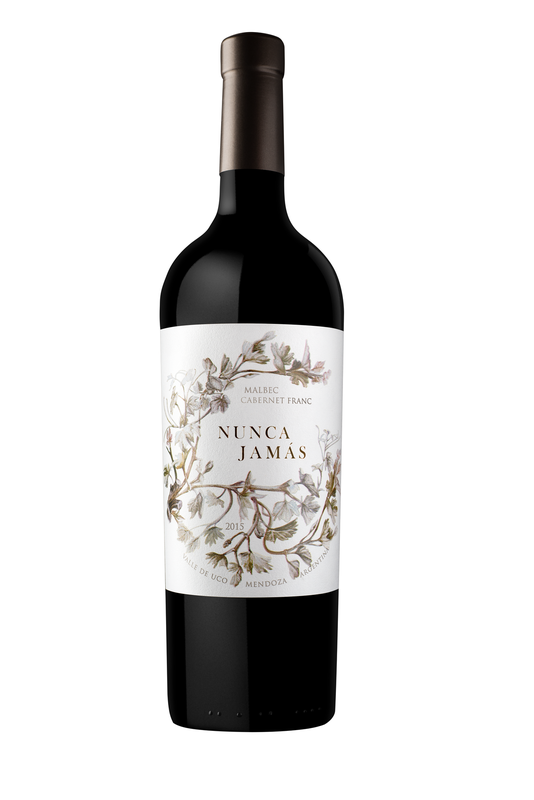 Nunca Jamas Malbec 2015 has blackberry, plum, violet and leather aromas. It has delicate and ripe tannins. It is a complex, vigorous and concentrate wine on the palate. Nunca Jamas Malbec Cabernet Franc 2015 has striking aromas of cherries, blueberries, peppers. It is minty and smoky. It is harmonious, voluptuous and sofisticated in the mouth, with a charming long finish. ETCETERA are wines of the year, full of fruit expressions. They give the floor to wine lovers who wish to continue the story of our Land through their own living and experiences. Production Area: Vista Flores, Tunuyán, Uco Valley, Mendoza, Argentina. Microclimate: Semi-arid high mountain climate, with hot, sunny days and cool nights (very broad diurnal difference, up to 15°C), and average annual rainfall of 200 to 300 mm. Soil: Poor soils, sandy silt loam of alluvial origin with gravel in the subsoil. Vinification: Traditional winemaking, starting with a cold maceration for 24 hours at 12°C, followed by 14 days of fermentation at 24°C. Short aging in second use oak barrels. Tasting Notes: The color is ruby red, with bright purple shades. The nose reveals aromas of Morello cherries, violets and chocolate. The wine has a frank attack in the mouth. It is well structured with a harmonious finish. Vinification: Traditional winemaking, starting with a cold maceration for 24 hours at 12°C, followed by 14 days of fermentation at 24°C. Short aging in French oak barrels. Tasting Notes: The color is brilliant dark ruby red. The nose reveals aromas of black currants, ripe plums, vanilla and spices. The wine has a beautiful structure and balance. Grape variety: 100% Torrontes Riojano. Microclimate: Warm and Semi-arid, with a very broad diurnal difference, and average annual rainfall of 100 to 200 mm. Vinification: Cold pre-fermentative Maceration (4h at 10°C), fermentation and maceration during 20 days in Stainless steel tanks with indigenous yeasts (15 to 17 °C). No malolactic fermentation. Tasting Notes: Pale bright yellow color. The nose reveals aromas of grapefruit, pear and rose petals and the mouth offers a voluptuous structure and balance of expressive fruit and delicate acidity.